Want to find some food growing support or connect your school with food and growing organisations? Take a look at this handy Directory below of local, London-wide and national organisations. 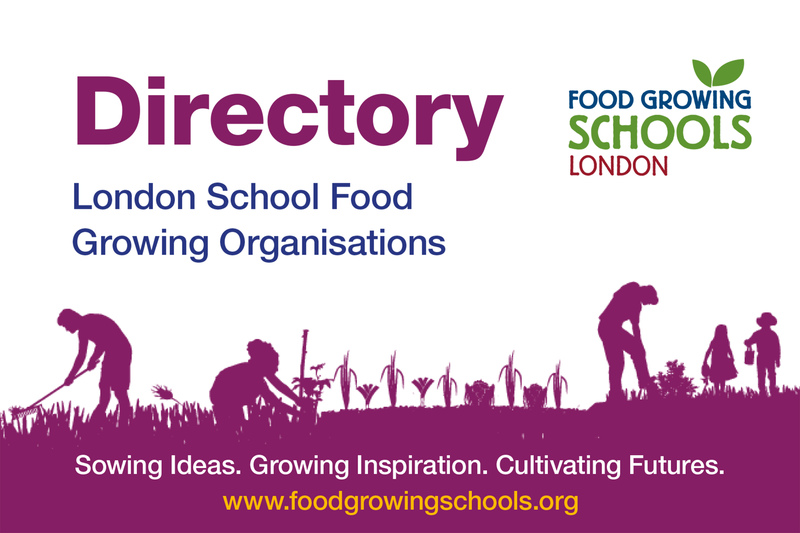 From city farms, community projects and gardens to volunteer support and educational resources, the Directory is your go-to guide to get the help and connections you need for your school's food growing journey. Search for your borough and discover the growing community and green spaces around you. Download the directory as a pdf or view the listing below on this webpage for the most up to date information. The Eco-Schools Programme follows a very simple international Seven Step process that forms the criteria for the Eco-Schools Green Flag Award. A Guide for Creating School Gardens as Outdoor Classrooms. The Center for Ecoliteracy promotes ecological education. We recognize that students need to experience and understand how nature sustains life and how to live accordingly. We encourage schools to teach and model sustainable practices. The award-winning Lessons from Africa, from Send a Cow, offers a collection of FREE curriculum led teaching resources that bring Africa and global learning to life in your school. The Big Dig is all about getting people involved in their local community garden. We hold national events across the UK that aim to raise the profile of community gardens and encourage more people to take part. Our core purpose is to make nutrition science accessible to all. Often in collaboration with others, we do this through the interpretation, translation and communication of often complex scientific information, making it relevant to the needs of diverse audiences, in particular the general public, the media, schools, health professionals, government, food and beverage companies and the primary producers of food. Chefs Adopt a School is a national charity which aims to tackle specific health inequalities, such as obesity, and also the lack of knowledge about food and healthy eating. We deliver food education in schools all over the country and many of the schools we work with are in deprived areas where there is a high percentage of free school meals. The Council for Learning Outside the Classroom is a registered charity existing to champion learning outside the classroom (LOtC). We believe that every child should be given the opportunity to experience life and lessons beyond the classroom walls as a regular part of growing up. These experiences expand the horizons of young people, opening their eyes to the wonders of areas such as art, heritage, culture, adventure and the natural world. We ensure that more young people have access to these life changing educational experiences by providing support on the ground, facilitating the sharing of best practice and promoting the benefits of LOtC in raising attainment and aspirations, reducing truancy and re-motivating those who are disengaged from their education. Supporting teachers and practitioners in using the ‘outdoor classroom’ as a resource across the curriculum for pupils of all ages. The website offers teaching resources, ideas for practical outdoor experiences and links with local services and networks. Farming and Countryside Education, FACE. We have over 80 partner membership organisations. All have a commitment to educational work associated with food, farming and the countryside. There is widespread concern about the way children, young people, and their families, have become disassociated from where their food comes from and do not know what is required for a healthy diet and lifestyle. They are also unaware of the many opportunities in the countryside for leisure and social activities, and for employment. FACE aims to meet these educational needs by working with our members and partners to promote visits to farms, and to provide easy access to a wide range of high-quality educational resources and activities to complement both school-based studies and outdoor visits. farms, co-ordinates meetings and facilitates the exchange of ideas and information, including peer teacher support. Our School Awards Packages supports schools to take a whole school approach that sees them grow their own food; organise trips to farms; source food from local producers; set up school farmers’ markets; hold community food events; provide cooking and growing clubs for pupils and their families; serve freshly prepared, well-sourced meals and provide an attractive dining environment so lunchtimes are a positive feature of the school day. Forest School is an inspirational process that offers ALL learners regular opportunities to achieve and develop confidence and self-esteem through hands-on learning experiences in a woodland or natural environment with trees. Forest School is a specialised learning approach that sits within and compliments the wider context of outdoor and woodland education. Forest School is the name of a specific ethos – a way of working with people in an outdoor natural space for an extended period of time, often a full year. Qualified practitioners carefully facilitate programmes which are uniquely tailored to the needs of the individuals within the group and have the fundamental aim of building participants’ self-esteem, confidence, independence and creativity. Garden Organic has been bringing the benefits of gardening to schools, big and small, for over 20 years. Our education programmes help teachers and school professionals to develop gardening projects that teach children where their food comes from, develops their scientific and environmental awareness and encourages them to eat more fruit and vegetables. We work with most local councils in the UK delivering top quality compost bins made in our UK factory from recycled plastic bottles. Our website offers a curriculum linked education resource for teachers and parents to inform school-aged children about the story of grain-based food; from the farm to mill to plate. Find tailored teaching materials, worksheets, videos, quizzes, recipes and activities about farming, milling and baking. aim to re-engage children with educational life, and enable them to fulfil their potential both in school and the wider social setting. Enterprise Growing Gardens (EGG) is a two year pilot run by Learning through Landscapes exploring the enterprise growing possibilities of school grounds. The delivery-focused project will support ten schools in London to establish sustainable EGG schemes through on-site workshops, business-to-school mentorships and lesson plan development. Selection for the second year will begin in June. Contact us at eggschools@ltl.org.uk to be added to our mailing list for participation and resource updates. LEEF is a network for London’s most innovative and passionate urban Environmental Educators. LEEF members have joined together to improve the quality and quantity of environmental education delivered to Londoners. The forum’s member’s work, freelance and volunteer for a wide range of organisations, in roles involving frontline teaching to backroom policy and everything in-between. Our members share information through regular face to face training sessions as well as a number of online groups. aims of encouraging social interaction and social action. Grants cannot be made for regular school activities, however new activities, additional to regular school life will be eligible e.g. afterschool food growing clubs in a local allotment or cookery sessions involving children/families from the local community hosted at school. OPAL aims to make more than a million people more aware of the open spaces and conservation sites around them, and more knowledgeable about the contribution individuals can make to protect them. Through new approaches to learning, people will gain the opportunity to become active participants with the knowledge and confidence to debate environmental issues. Launched in 2005, Grow Your Own Potatoes (GYOP) was one of the first primary school based growing projects. Since then it has become the largest of its kind with over 2 million children taking part in learning where potatoes come from, how they grow and that potatoes are a healthy food. Its simplicity and the fact that GYOP is a hands on activity makes it perfect for young pupils. Schools that register to take part (in Feb) receive a FREE growing kit containing everything they need to grow a successful crop. The RHS Campaign for School Gardening aims to encourage and support schools to develop and actively use a school garden. As part of the Campaign we provide teachers with resources through this website and an extensive programme of CPD days. The School Food Matters website is for anyone who cares about school food and food education. Here you will find evidence of why school food matters, great examples of best practice and fun ideas to get children cooking and growing and out onto a farm. Whether you already have a food growing garden or are planning one, the School Global Garden Network will help you make the most of your edible classroom. This website is a doorway to a cornucopia of resources which show how the school garden can be a resource for the whole curriculum, as well as the Sustainable Schools strategy, Healthy Living Blueprint and global citizenship. Slow Food Kids encourages children aged 4 to 12 to experience food in an entirely new way, through each of their five senses: Seeing, Hearing, Smelling, Touching and Tasting. The activity is run by local groups, and the educational kit can also be made readily available to anyone, so that Slow Food Kids can be run by volunteers at festivals, schools and even markets. The TES story is an extraordinary one: its digital community is one of the fastest growing of any profession globally, and it boasts a 100-year heritage at the centre of teaching and the education community. Today, with more than 3.6 million registered online users in 279 countries and territories, TES is the world’s largest online network of teachers. More than 4.9 million resources are downloaded from the TES websites a week, with ten TES resources downloaded a second. Home to more than 780,000 individually crafted teaching resources developed by teachers for teachers, this unparalleled collection helps to guide, inform and inspire educators around the world. The Country Trust is a national educational charity dedicated to bringing alive the working countryside for children least able to access it. We operate throughout England and Wales, working with primary schools in urban areas of high deprivation. Each year we help more than 25,000 children to understand and experience the working countryside. Our work is split into three connected strands; Farm visits, Residential trips and Food Discovery projects. The Herb Society is an internationally-renowned educational charity dedicated to encouraging the appreciation and use of herbs in cooking, gardening, cosmetic, historical and medicinal uses for professionals or amateurs. Whilst the majority of members are in the UK we have members worldwide including the USA, Thailand, Japan, South Africa, Australia and Europe. The National Allotment Society (NSALG) is the leading national organisation upholding the interests and rights of the allotment community across the UK. We work with government at national and local levels, other organisations and landlords to provide, promote and preserve allotments for all. We offer support, guidance and advice to our members and those with an interest in allotment gardening. Secret Seed Society aims to spread the fun of growing and cooking your own food with children. Kids active in the garden and the kitchen gain life-skills, a connection with nature and a healthy attitude to food. Join us in sowing the seeds of healthier happier living. Schools can help children lead a healthy lifestyle directly – to make healthy food choices at lunchtime, to be active at and on the way to school. More widely, schools can help children learn about their health, and develop their motivation and self-respect to make healthy choices. With our award scheme sponsored by the Mayor of London, we will recognise and celebrate schools that are making a difference for their pupils. By working together with our colleagues in London’s boroughs, we want to build a programme that schools are proud to be part of, and helps London’s children to be healthy, happy and achieve. The London Sustainable Schools Forum exists to make connections between people across London who are trying to help schools become more sustainable. We are teachers, local authority officers, third sector workers, private sector workers, governors and others who volunteer our time to run the LSSF. initiatives, park user groups, schools and other community groups to help design, plant and maintain community orchards in the nation’s parks, housing estates, schools and universities. EcoACTIVE is an innovative environmental education charity with a reputation for using hands-on, practical approaches to explore complex issues of sustainability. EcoActive envisions a world where young people and communities are agents of change for creating a better planet. We design and deliver interactive workshops to empower people to take meaningful action on sustainability. If your school is in the London Borough of Hackney, we can offer you FREE workshops due to generous funding from LBH Waste & Recycling Department. Team London provides a London wide database service to match volunteers and organisations with community groups and schools. Capital Growth is a network of all types of food growing spaces in London, and can signpost your school project to local advice, training and events as well as running its own London-wide programme of activities to help anyone wanting to grow food. Garden Organic are leading on Project Learning Garden. It encourages and supports schools to set up and use gardens as an outdoor classroom. By enabling more teachers to take their classes outdoors, more pupils will ave the chance to work in the gardens and cook the food they harvest. PLG will be rolled out to a limited number of boroughs, please visit the website for more information. The farm aims to produce excellent, organic food closer to where people actually live as well as helping local residents to gain skills in food growing, preparation and selling. Dagenham Farm shows the potential for growing - and selling - significant amounts of produce from farms on the outskirts of London and other cities. The sessions are totally free and open to everyone. No experience is necessary - children welcome - all we ask is for is bucket loads of enthusiasm! The Green Club is held every Saturday at Harlesden Town Garden 10am to 1pm. Each week Green Club Members get stuck in with making Harlesden Town Garden a better place. They also learn how to grow their own fruit and vegetables under the expert guidance. We run a Growing Club twice a week on Wednesdays and Sundays from 10am to 2pm. Transition Town Kensal to Kilburn promotes community sustainability. Numerous helpful groups exist that can provide help and expertise with food growing. Situated in High Elms Country Park, BEECHE is an education and visitor centre offering environmental education to schools in term time and opens as a visitor and information centre on weekends and during school holiday. People from all cultural and diverse backgrounds participate and enrich our activities. Our volunteer and training programme helps people learn new skills, provides opportunity for social interaction and outdoor exercise. Environmental and food growing sessions encourage and develop awareness of organic methods and composting. We offer educational tours for nursery, reception, KS1 and KS2 classes for up to 30 children plus adults. Tours start at 10:30am or 1:30pm and last approximately one and a half hours. The Skip Garden is the largest of the 26 community and commercial gardens that we have co-created with local businesses, restaurants, schools and young people in and around the King’s Cross Development site. Here we grow fruit and vegetables alongside our thriving café, where we serve nutritious, seasonal food. The café also offers work experience and employability programmes to those often marginalised by society, such as young people with special needs, the elderly and refugees. MindFood is an ecotherapy social enterprise based in Ealing that supports people from West London with mental health issues such as depression and anxiety to improve their wellbeing through growing and selling food. The Mudchute education project provides a unique resource for schools and local children. The project works with local schools by providing structured activities and courses in environmental education, science and farming topics. These are linked to the needs of the National Curriculum and focus on a wide range of subjects, including biology of plants and animals, geography, environmental issues, art, english and maths. The project also offers a well-resourced ‘living classroom’. The farm serves as a unique outdoor classroom and offers an invaluable teaching resource. We welcome visits from all different learning stages, from nurseries to secondary schools. We offer interactive guided tours for your class on selected days of the week. Bring your class to Stepney City Farm and have fun whilst meeting your national curriculum targets. We offer high quality learning experiences and have been awarded the Learning Outside the Classroom Quality Badge. We are a network of people and organisations working towards a fairer, more sustainable, healthier Greenwich. Join us and get involved! Woodlands Farm Trust, an 89-acre working city farm. Find out about farming life and experience the countryside including native bird species, butterflies, wild flowers and ancient woodland. We are dedicated to helping people learn about food, nature and the environment. Our unique setting inspires children and adults to participate in our courses, workshops and lessons and leave with new knowledge, friendships and inspiration. We receive about 3 school visits a week – school groups, like everyone else can visit for free! We also offer specific workshops designed to take learning a step further, such as creative recycling, growing plants and hatch and brood. Made In Hackney deliver fun, supportive, often life changing courses in local food growing, cooking and composting skills. We work with local charities, community organisations, housing associations and support groups to ensure our courses are offered to people most in need such as low income families, children in care, teen carers, young people excluded from school, parents and children, and people suffering from diet related health problems. and other social landlords in community food growing projects. We can help you start from scratch and build a new garden, support an existing food growing group, or provide bespoke training for both residents and housing association staff. We deliver a range of educational sessions covering aspects of history, geography, science and citizenship. Our programme follows the national curriculum with the local area as a focus. We work with schools across the Tri-borough’s of Hammersmith & Fulham, Kensington & Chelsea and Westminster. More information can be found above under Hackney. More information can be found above under Barking and Dagenham. The garden is a food growing hub, teaching people to grow and improve health and wellbeing. This includes volunteering, work placements, gardening clubs, events, workshops and activities. Everyone is welcome in the gardens. Our targeted beneficiaries are children, over 50’s, long-term unemployed people, young offenders and young people with learning difficulties - with specific activities aimed at them. Hen Corner is a little bit of country life in London, we’ve got an overflowing kitchen garden, eleven fruit & nut trees, a growing flock of hens and three colonies of honey bees. Children see the new National Curriculum brought to life through visits and training as they discover first hand where their food comes from, explore lifecycles, discover the secret lives of birds and insects, learn about habitats and much more. Explore veg growing, composting, together with wild flowers in a limited urban space. A variety of interesting projects occur at different times of the year. More information can be found above under Haringey. The Ecology Centre offers exciting, curriculum-linked education programmes for pre-school groups and primary schools. For details and costs of our school programme, download our current leaflet. The Ecology Service work includes: promoting awareness and understanding of biodiversity and the local environment through formal and informal education, protecting sites which are important for nature conservation, developing local policies for nature conservation, advising on the management of open spaces to enhance biodiversity within the borough. Borough (RBKC), our goal is to use the wealth of food & gardening experience available locally to educate and motivate children to make healthier food choices. We aim to improve long term eating habits & food education by exposing children to a wide range of fun, practical skills & experiences. Primary school visits are our bread and butter, with some local schools coming back several times a year. We firmly believe that all aspects of the national curriculum can be enhanced by a fresh approach out of doors. Our gardens and greenhouses are constantly changing meaning there is always something new to experience no matter what the season. The Garden Museum aims to inspire learners through its collections, temporary exhibitions, architectural setting and gardens. Gardens and gardening can be a source of wellbeing and enrichment for children and adults and also a focus for greater awareness about issues relating to the environment and sustainability. Roots and Shoots is keen to involve children in environmental education by hosting school visits to the wildlife garden. Teachers can discuss their needs and arrange a visit by contacting us by email. The majority of the regular school visits tend to cover a few specific aspects of the curriculum — ‘mini-beasts’ (including pond life), food chains, habitats, the parts of plants and plant growth, the seasons. Occasionally a school will ask for something on history, change and the local environment. Founded in 1910 in Tulse Hill, South London, we have a beautiful botanical garden and run a wide range of courses, workshops and events for all ages. We also welcome school groups for visits. SCCG is committed to making the most of the garden’s potential as an educational resource. We teach people about the wonders of growing fresh fruit and vegetables via weekly volunteer sessions, food growing workshops, and activities for school groups. Think Outside runs outdoor learning clubs in Wandsworth schools, both as part of the curriculum and after school. “Outdoor learning” is about much more than just teaching children gardening skills. It is about healthy living, food and wildlife – all fostering teamwork in a fun environment where new skills are honed and new friends made. Vauxhall City Farm is the most centrally located farm in London. We are FREE to access and open Wednesday-Sunday 10.30-4pm. We specialise in educational, recreational and therapeutic services and activities ranging from school trips, workshops, gardening projects and birthday parties to Riding for the Disabled. are dependent on garden staff availability. If you’d like to focus on a particular topic then please let us know, if we’re able to personalize your visit to link in with studies in the classroom, we’re happy to help! The Greener Schools Network has been set up by EcoLocal with the help of a retired local secondary school teacher, Hazel Gurr. The Support Network offers local schools help in developing environmental projects. So far over 60 schools and Children’s Centres have benefited from this project. We can provide free help with: rejuvenating an old school garden; sourcing materials; what to plant & when to plant; ideas to get the whole school involved; setting up a green group. Abbey Gardens, a community garden in West Ham surrounding part of the ruins of a 12th century abbey. There are free garden club sessions and new gardeners are always welcome. The garden is open to visitors from dawn till dusk. Why not go along to a gardening session at your local community garden and share some skills? people to enjoy eating, sharing, cooking, growing and learning about food together in a beautiful 350m2 wheel-chair accessible garden and outdoor classroom. The farm is all about providing the local community with a great facility - especially for local children to enjoy. This is why we are so popular with local schools who can arrange guided tours with a member of the farm staff. Throughout the year there are exciting activities on the farm for children to take part in and there are regular workshops and clubs that they can join. Brooks Farm is part of Capel Manor College, London’s premier place to study land based courses, is situated in Skeltons Lane Park and has been a feature of community life in Leyton for over 20 years. Along with a range of animals including sheep, donkeys, ponies, goats, rabbits and hens we offer a range of farm based learning activities for the wider community. As well as being a lovely city farm, Brooks Farm is a place to study full time and part time courses. It is also a well-equipped Outdoor Learning Centre and ideal for school groups and parties. You will need to book these activities so please contact us for availability and prices. teachers. Taught by experienced and enthusiastic Kew staff, the school visit programmes cover all stages of education and are aligned closely with the National Curriculum and work schemes. SWLEN has been supporting food growing in the Borough of Richmond for several years, especially at schools and by community groups such as Ham United Group. SWLEN has worked with a variety of local partners, including Richmond Council, Richmond Churches Housing Trust, schools and local organisations to set up more food growing projects in the area. We can help with advice on issues such as fundraising, accessing cheap materials, what to grow and setting up a constitution for your group. The Holly Lodge Centre is a unique small charity in the heart of Richmond Park. Our exceptional educational programmes explore science, nature and history, and specialise in activities for people with special needs. We have 6,000 visitors a year from school groups, young people and adults. Our aim is to educate the general public in bee-keeping. Twickenham and Thames Valley Bee-keepers hold free classes for individuals, offer opportunities for group visits. The core remit of Surrey Docks Farm is one of education. Alongside the day to day business of running a farm, we offer a wide range of training and educational opportunities facilitated by experienced and trained staff. We welcome school visits of all ages. We also offer seasonal incubator projects, for schools to hatch out chicks in their classrooms. for people to cultivate skills, get exercise and make friends. Organiclea is working with London Borough of Waltham Forest (LBWF) to develop and implement its Borough Food Strategy, which includes a focus on developing food growing activity in local schools. We support schools to develop food growing projects through: providing support to set up food and wildlife gardens; running gardening clubs; training staff; running gardening courses for parents; supplying materials such as compost; plants and seedlings (including specially devised school plant packs to crop during term time); running educational visits and workshops for schools at our main growing site and offering general advice (as a Capital Growth local lead). Help to plant, grow and harvest plants and vegetables in our purpose built raised garden and large polytunnel. All wheelchair friendly. This activity provides proven benefits which include education, learn new skills, improved self-confidence and helps to foster a sense of personal achievement.